Life has been a tad busy in our household the last few months. However, it has not deterred himself from retreating into the hallowed halls of the Man Cave at every opportunity. True to the call of the Vikings, or is it Cave Men, he proudly showed me this item just a couple of weeks ago. 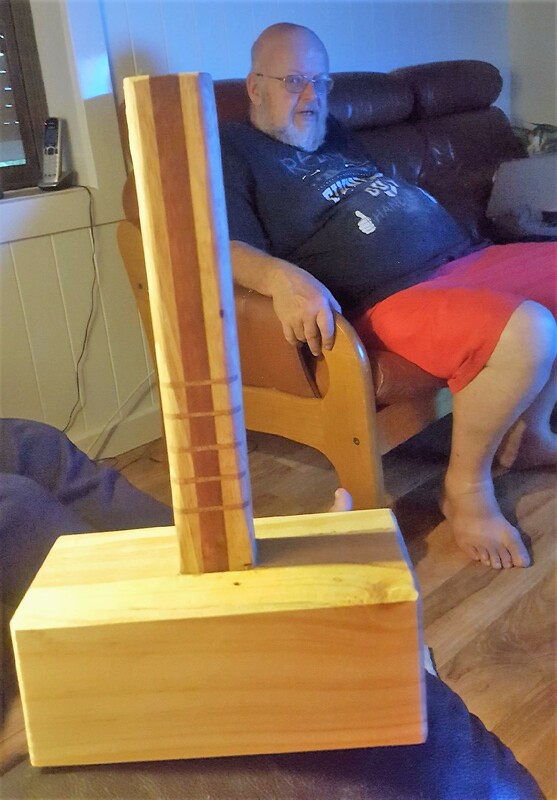 Contrary to what may be expected, it is in fact a Pallet Mallet. In other words it’s a wooden hammer thingy when you need to use a wooden hammer thingy to whack whatever it is that gets whacked by it in the Man Cave. I am happy to report that no animals or people have been, or will be, injured. Just yesterday he disappeared for a couple of hours with his father in tow. Not to the Man Cave. Out. In Big Red. I was not privy to whither they had ventured. I assumed Bunnings. It’s his second much loved home. This time. however, I was wrong. They had gone to a different Bunnings that is not a Bunnings at all. The name and location of this Not Bunnings place has not been disclosed. I am not in the Inner Sanctum of Need To Know. In due course Big Red reversed into the carport. That was my first clue that this Man Cavers excursion was not the usual one. You know, the kind where you have to nip out to collect more glue, or screws, or nuts and bolts. I knew he had been making room in the Man Cave for an addition of something or other. And had made a new trolley on wheels. I assumed the new inhabitant had been brought home. Taking a deep breath, I sneaked a look when no-one was looking. Yep. I was right. There was a gleaming new machine sitting pretty on top of its new home on wheels. Some kind of special sanding machine, I was informed. It would seem one can never have enough sanding things. Not being a sander myself, I could only assume it must be akin to not having enough different size crochet hooks or knitting needles. Or other more exotic crafting tools. Contrary to the usual mantra “I don’t need to ready the instructions”, he has been reading the instructions. Wow – that’s a first! Must be a bit more challenging to use than your normal belt sander or sandpaper wrapped around a block of wood. 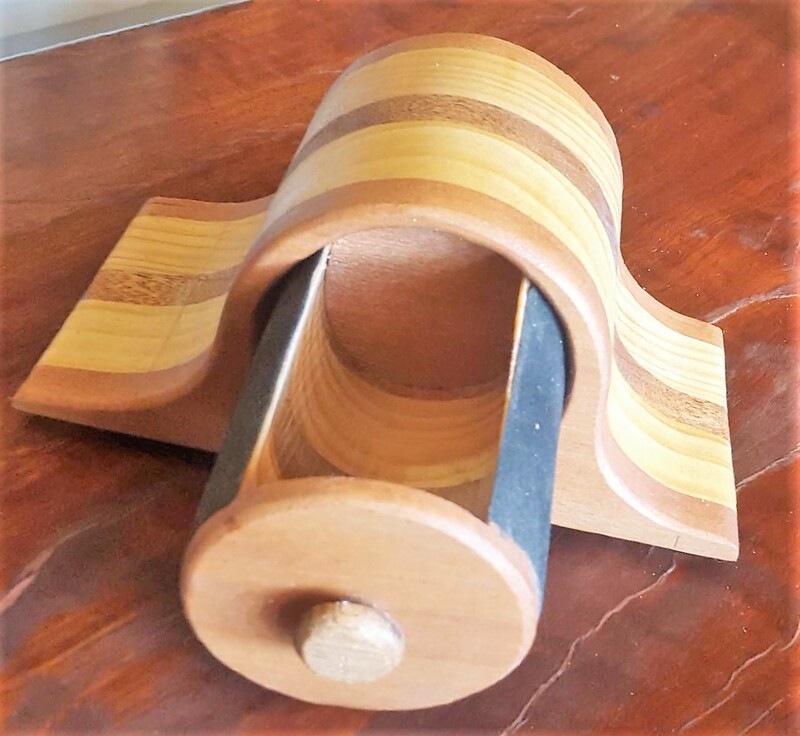 A napkin holder – because I needed one. 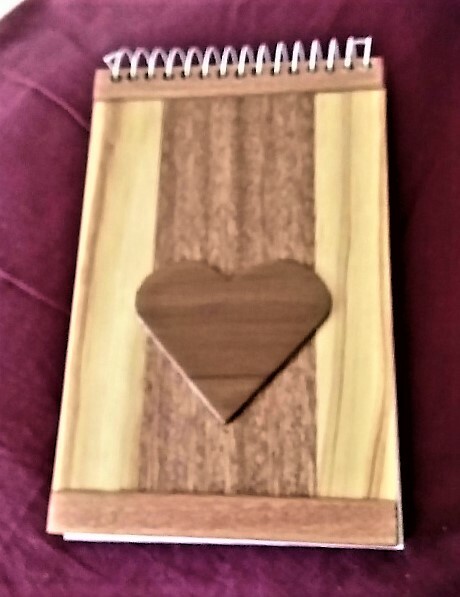 A notepad cover. I am looking forward to seeing what else emerges when the new machine is doing its thing. Those are really beautiful items. I do like your keepsake box. A keepsake in itself. It is destined to be a wedding gift. 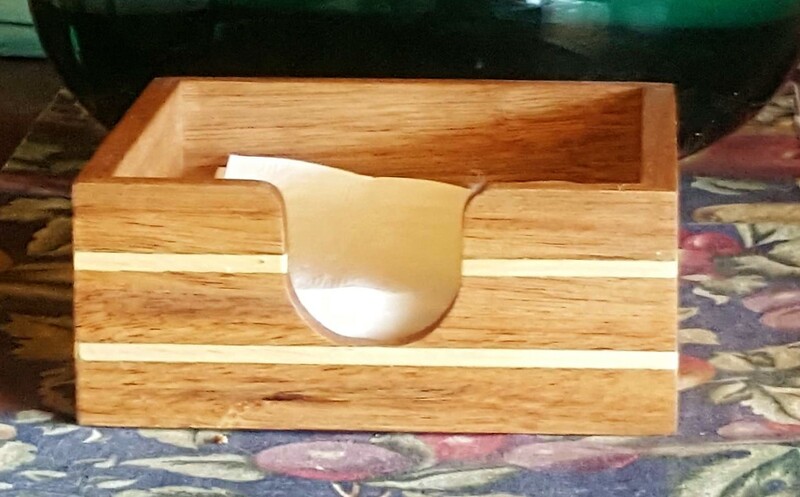 He made a wooden bow for the box too! Getting seriously talented …. Wishing you well, and hoping you are keeping cool where you are.. My hubby just came indoors and its minus 4C outside this morning. I have high expectations now – and there can’t be too much more room left in the cave for new additions. Although I suspect he is scheming on how to expand the cave. I put a ban on taking over our master bedroom! The only way left is out to the carport – which now has an empty space…. 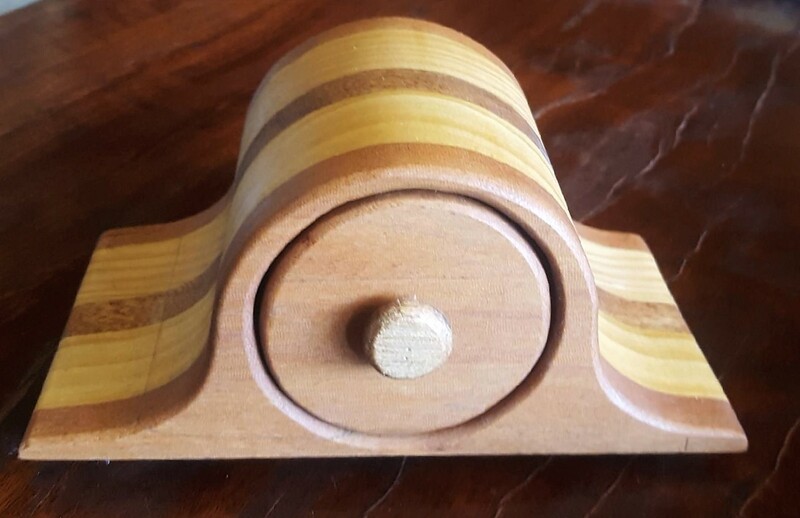 uses different colours of wood. The man cave has been busy…good busy. Relly nice work coming out of the cave. You’re right, it is a good busy. I expect to see more seriously good stuff coming out now that he has his new toy! He’s getting pretty good. Given that he spends hours glued to YouTube tutorials has helped hone his skills. We’ve had a few days of cool weather, which is wonderful. Going to heat up again over the weekend, but not to quite the extreme we had last week, thank goodness. He should go into business!